This video or live course is only for those who have taken the basic SMRT: Arm & Hand video or live course. 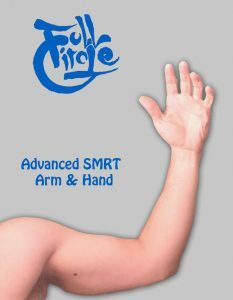 We begin with SMRT releases for the muscles of the upper arm, forearm and hand. Adding to our existing knowledge, we will explore different releases for each muscle. Along with adding new releases, we will go through two handed releases for each muscle. Next, we will add in releases for the lateral shoulder and axilla, and finally, we will work on muscle binding and release the perimysium (the connective tissue surrounding each muscle bundle) and the endomysium (the connective tissue surrounding each muscle fiber) to reduce binding and allow optimal space within each muscle. Moving from the muscles, we will work directly with the bones. We will begin by assessing range of motion in the shoulder, elbow, wrist, and hand joints. Then we will address each bone looking for mobility and position of the bone and how that effects or is affected by the muscles. As we go, we will learn to look for divergent points in the bones, and we will learn how to use SMRT to unlock these divergent patterns. Fascia will be our final piece in the initial phase. Changing our focus, we will learn how to apply SMRT to directly target the fascia, tendons, and ligaments in the upper arm, forearm, and hand. Finally, I will do a demonstration on one client to show you how to apply these advanced SMRT techniques. Before you purchase a home study course for continuing education please review the requirements for your state. After watching and reviewing the course therapists will have to pass an continuing education exam to earn CE credits.